A new garden built on an incredible site with stunning sea views. The landscape is a simplified, curvy and planted with mostly local indigenous species. The front is bent mild steel and gravel to expose and reflect the minimal facade. Slightly mounded garden beds of Dichondra, Casuarina and local Tea Tree with a Porphyry paved path subtly defining the front entrance. 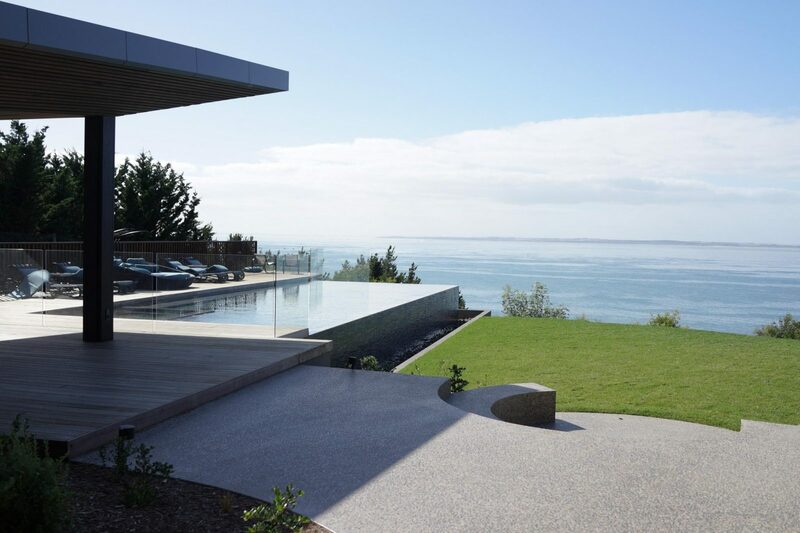 The rear garden opens out to the ocean with a curved terrazzo fire pit, open lawn and revegetation. The house was undergoing renovation by Architect Michael Jan. Photographed just after completion, it will be exciting to see it soften after a few years of growth.